A few of the 900 artifact casts that make up NAU's collection. Dating back to the Stone Age, ancient artifacts provide us an important window into the history of ancient civilization. Thanks to Northern Arizona University’s lithic casting lab, students are getting to work directly with these artifacts, using new technology to create replicas. 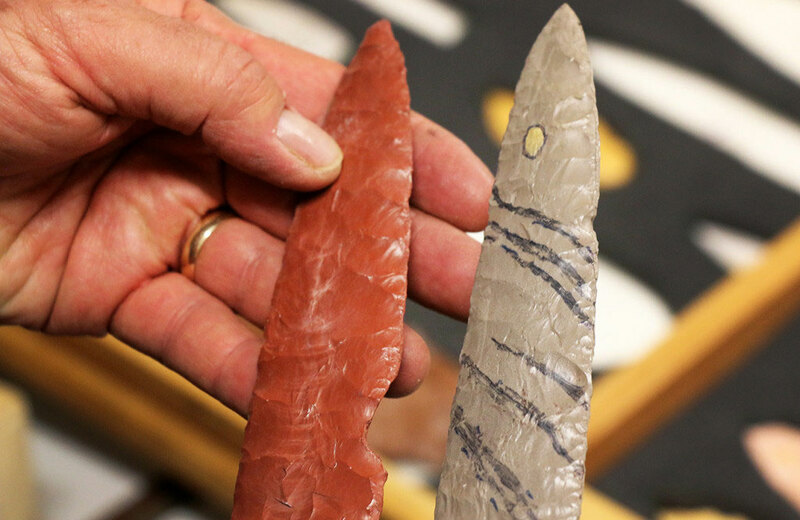 Francis Smiley, professor and curator of the lithic cast teaching and research collection, has spent the last three years building NAU’s collection of more than 900 epoxy resin lithic artifact casts. Lithic refers to sedimentary, igneous or metamorphic rocks, eroded down to sand-sized grains combined to mold and create different shapes. The casting process uses the lithic grains to make 3-D replicas of various artifacts, giving archeology students a hands-on experience that may otherwise be unavailable. Graduate and undergraduate students regularly use the stone casts to investigate research, complete class assignments and learn about the history of human technological development. The artifacts, which come from North America, Europe, South America and North Africa, date back two million years. Smiley’s primary focus is replicating relics from the Clovis people, the earliest inhabitants of the Americas dating back 13,000 years. The artifacts that Smiley has casted at NAU are displayed in museums and universities around the world.